These are so cute! I think we each need a pair, Smock. Unfortunately, the $311 pricetag will probably keep us from having them, but I can dream! so pretty! and perfect for st v day, no? Gorgeous...but I don't think I could walk in them. 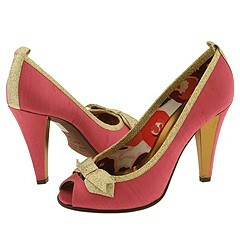 But if I were fabulously well to do, they are the kind of shoes I'd buy just to admire. OK, Smock. Remember I wear an 8 1/2. If I wanted them, I think I'd buy a pair of red open-toe pumps and some gold braid and ribbon, and then slipstitch the braid around the upper edge and make little flat bows to glue onto the toe. Possibly I'd secure the bows with a stitch or two as well. After all, pretty as they are, one couldn't realistically expect to wear them more than three or four times, so they wouldn't need to withstand very hard wear. I'm with Ellyn, however: I couldn't possibly walk in them. This page contains a single entry by MamaT published on January 16, 2008 8:38 AM.